Oh, the breads of Italy. Somehow, not quite as famous as their French cousins, yet every bit as delicious – and sometimes, I’d even give an Italian bread the edge. (Mind you, I’m not referring to American-grocery-store “Italian Bread”. Generally, in grocery stores, you’ll find a generic, insipid French Bread and a generic, insipid Italian bread, and the only difference between the two is that the Italian Bread is softer. Neither bears any resemblance to its namesake.) However, Italian breads have name recognition on their side: many people can easily name focaccia, ciabatta, panettone, or pizza (it’s a bread! ); but how many different French breads can you name? I know you’re saying “baguette” right now, and not much else. Why is this? Well, like so many other facets of life, politics got involved. Italians, of course, have that long history of political divisions. The land was full of warring factions, fighting over far more insignificant things than bread. So different regions developed different breads, and each party clung fiercely to their own kind, perfecting it over time. Of course, the bread outlasted the wars, and thank god for that. A baguette is all well and good, but sometimes you just need a good Italian pugliese instead. This first bread is new to me. And I’ll be honest – I decided to make it because I didn’t have time to wait for an overnight starter, like many great Italian breads require. Mostly composed of semolina flour, it has a more grainy texture than the typical loaf of bread, but that also gives it a fabulous pasta-like flavor. It has a very dense crumb, but is not crumbly. Like pasta, this is more of an “ingredient”, a bread best served with something else, as opposed to just eating on its own. The almost nutty flavor of the semolina makes it a perfect pair for a plateful of various cheeses. Formed into a pretty and unusual scroll, it would be a lovely centerpiece on any table. Alternatively, it would be great for bruschetta, sliced and toasted, topped with a flavorful tomato-basil-garlic mixture. Or, if you find it’s gone a bit stale on you after a day, try tearing it into bite-sized pieces for panzanella (a.k.a. bread salad) which is a perfect and delicious picnic food (if you happen to live where it’s warm now!). I really can’t think of any better use for leftovers of this bread than to mix up a big bowl of mozzarella, tomatoes, cucumbers, and onion, all drizzled with a bright vinaigrette. Summery and fresh, it’d be just the thing to take my mind off all the snow still piled on the ground. So what if I can’t go outside? Maybe I’ll just have myself a living room picnic instead! 1. Mix the yeast with half of the water until dissolved. Let stand 5 or 10 minutes, or until foamy. 2. Mix the semolina, white bread flour, and salt together in a large bowl and make a well in the center. 3. Pour yeast mixture, remaining water, and olive oil into center of the flour mixture, and gradually incorporate the semolina and flour to form a firm dough. 4. Turn out onto a lightly floured surface and knead for 8-10 minutes or until smooth and elastic. Place in a lightly oiled bowl, cover with lightly oiled plastic wrap, and leave to rise in a warm place for about 1 1/2 hours, or until doubled in bulk. 5. Turn the dough out onto a lightly floured surface and punch down. Knead gently, then shape into a fat roll about 20 inches long. Form into an “S” shape. 6. Carefully transfer the dough to a greased or parchment-lined baking sheet, cover with lightly oiled plastic wrap, and leave to rise in a warm place for 30-45 minutes, or until doubled in size. 7. Meanwhile, preheat the oven to 425º F. Brush or spray the top of the scroll with water and sprinkle with sesame seeds. Bake for 10 minutes. Spray the inside of the oven with water twice during this time. Reduce the oven temperature to 400º F and bake for a further 25-30 minutes, or until golden. Transfer to a wire rack to cool. 1. You could certainly form this bread into a long baguette shape, to make it easier to cut. But the “S” shape is so unusual and pretty, and I just love it. 2. 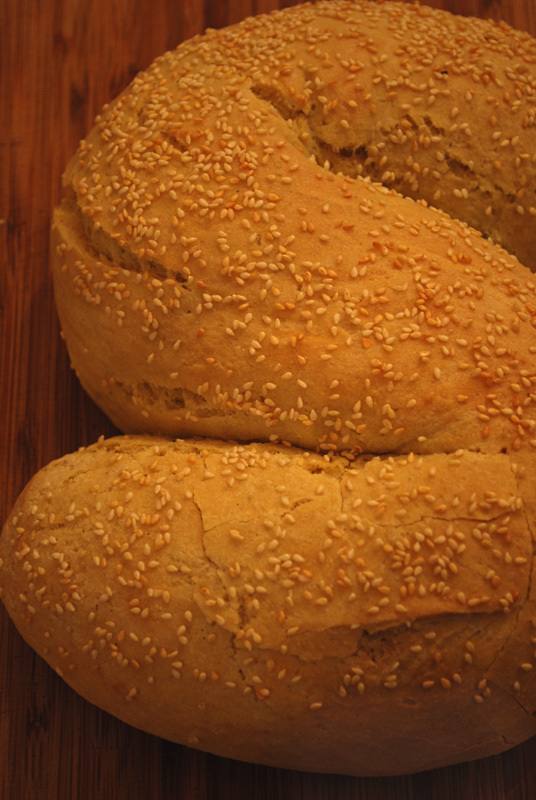 Sesame seeds are the traditional topping for this bread, and give it a wonderful crunch and flavor; but poppy seeds, flaky salt, wheat bran, or any other topping you like would not be out of place. 3. I’m not sure my semolina was what I’d call “finely ground”. It was rather coarse, actually, making for a somewhat dense and grainy loaf. It was certainly not unpleasant, though; I rather liked it. Just use whatever semolina you can find!